BOWSER’S CASTLE – Vowing never to repeat the prior year’s debacle, the sovereign and supreme ruler of the Koopa Kingdom summoned his “Thanksgiving Planning Committee” before him today for an update on the preparations for his annual holiday dinner party. “LACE?” boomed the great fire-breathing conqueror, the unrelenting threat whose spiked, menacing shadow has hung heavy over the Mushroom Kingdom for a generation. A very ordinary, green-shelled Koopa Troopa began the long, slow climb up the tall column of stairs leading to where Bowser himself was seated, carrying with him a book of fabric swatches. Upon a platform at the top of the stairs, King Bowser himself waited impatiently and looked down from his royal throne – an impressive chair with an ornate back of mosaiced turtle shells, polished to a shine. 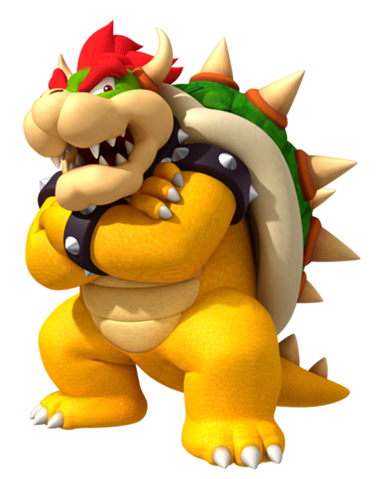 He was not the first and only to ever rule the Koopa Kingdom; he was only the latest in a long line of successors. But it did not stop Bowser from living as though he would be the last. In fact, the entire design of his castle was done for the comfort and convenience of just one inhabitant: the current King, the greatest, the bright, dividing line of Koopa history. The comparatively tiny turtle, panting visibly, finally reached the top of the steps and surrendered the thick book of fabrics to his King. “I will review your recommendations later,” Bowser warned, sending the frightened subordinate away with a wave of his hand. “Now, tell me about the entertainment,” he commanded. The members of his Thanksgiving Planning Committee stood in a straight line, execution style, before their judge. This time, a plain, red-shelled Koopa Troopa stepped forward and looked up nervously at Bowser, at whose mercy he lived each day. “No comedy this time?” the King inquired, but more so an instruction than a question. It enraged and horrified Bowser to recall last year’s dinner entertainment: the shameful and offensive antics of his cousin Lemmy, the least mature but most personable of the seven royal Koopaling siblings – a family of unfortunately close relatives. During his fifteen minutes of crude fame, Lemmy managed to give each one of Bowser’s guests a reason to feel insulted. Memorably, he made numerous accurate but vulgar observations about the unfortunate shape, color, and smell of Goombas. His routine ended abruptly when Bowser, livid and literally fuming, crashed onto the stage and violently ejected his cousin from the premises, throwing him like a baseball through a high window. Very hesitantly and only after a prolonged pause, a lone Monty Mole stepped forward and meekly lifted his squinted gaze toward his master’s cruel, monstrous face. The tremendous beast rose from his seat in anger. “King Boo informs you that he will be hosting his own Thanksgiving dinner party this year,” mumbled the poor mole, the message visibly draining him to relay. “LEAVE ME AT ONCE! ALL OF YOU!” the mighty King roared. Bowser punctuated his fury with a great fireball unleashed directly at the unwilling, conscripted participants of his party planning committee, scattering them in a panic as they fled. He returned to his throne, stunned. The great demon king set a thick, clawed hand on top of his head, flattening his legendary, vermilion mohawk.